This post is sponsored by Babylist. All opinions are my own. A few months ago, I was helping my sister put together her baby registry for her first child. She's not into "stuff" anymore than I am, and didn't want a bunch of baby gear taking up her home. I crafted this baby registry list, which has all the basics of stuff you NEED when you have an infant, with a small section at the end with some "nice to have" items. This list still holds true for all the basics for twins, too! Of course, with twins there are a few more things you're going to want to add to your registry, or tweak a bit from this list of classic items, so I've partnered with Babylist to bring you the must have on a twin baby registry. Go to my first registry post for all the need to have basics (just times it by two!) and then add these items which are must have needs specific to twins. First, before you even start your baby registry, did you know there's an online resource that will let you pull items from literally any store and have it all in one place?! Where was this when I had my first baby and really went hog-wild with my registry?! It's called Babylist and it's literally the easiest thing in the world to use. 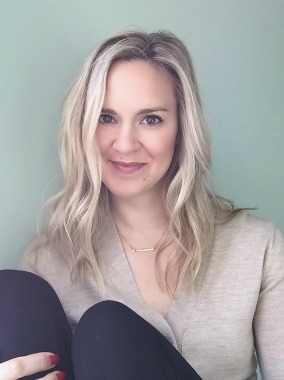 No dumb in-store scanner that doesn't work, no going to multiple stores and having multiple lists/registries on your baby shower invites - just a one stop shop that you can add everything you need and want to. Want to support independent artists on Etsy or your favorite baby boutique? Yup, you can add items from their shops when you use Babylist! It's insanely simple to use. When you go to the site to register, you drag and drop an "add item to Babylist" button to your toolbar that enables you to add any item from any store to your registry. When I created my registry for our twins that are due in the fall, I was able to add items from Babylist (they keep their own stock of baby items! ), Amazon, PBK and Etsy with one simple click. Mega bonus! Once you've registered for several items, you're eligible to receive a Hello Baby Box, full of sample goodies and offers for you and baby. 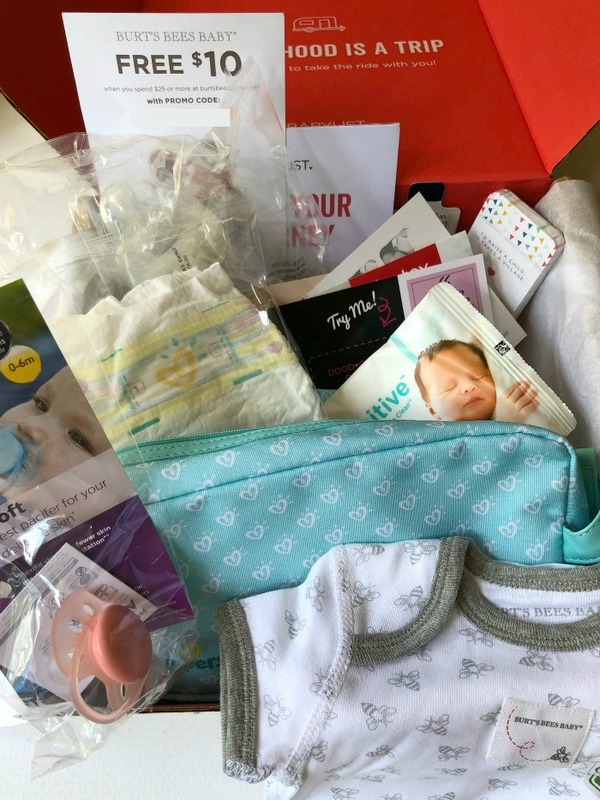 So you can get all the things you want off Amazon, Pottery Barn Kids, Target, Buy Buy Baby and more retailers PLUS get the opportunity to be sent an awesome welcome box. Winning. Click here to start your own Babylist registry and the chance for your Hello Baby Box*! *For US residents only, while supplies last. Box contents may change monthly. Restrictions apply. The singleton version of this is on my other registry list, but if you're expecting two, you'll want this plus sized version so that you can tandem nurse, do skin to skin while one nurses and the other cuddles, or simply as a way to more easily hold both babies at once. Since c sections are more common with twins, the back support of the Breast Friend will be essential! 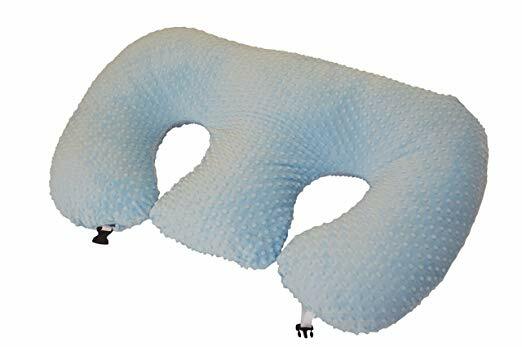 I've had a c section and a VBAC and the back support and wrap around feature of this pillow are what make it superior to all others, in my opinion. This is basically a solid multitasking pillow for twin moms! If you're bottle feeding, you can prop both babies up in it and hold their bottles until they're able to do so themselves. It's great for tummy time. As your twins begin to learn how to sit on their own, this will be a great tool to keep them from falling over and teaching them how to move their weight forward to sit solo. For the first 6-9 months of the twins' lives, this will be your go-to set of "second hands" so that you're able to get through your day with two babies. I knew from having Henry and Otto that a lightweight car seat is essential. 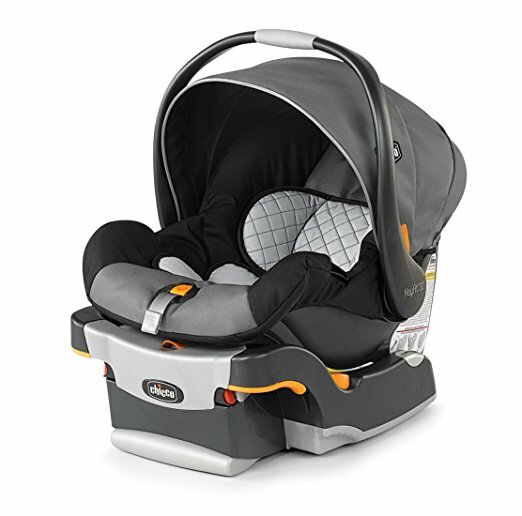 That infant basket gets heavy quickly, and if you get a "fancier" car seat, odds are the seat alone is at or over 10 pounds (Britax, UppaBaby, Maxi Cosi, I'm looking at you!). That nullifies the benefit of the infant removable bucket seat REAL quick. What I love about this seat is that it's the most narrow seat on the market. You're having more than one kid, so you'll need to get everyone in the car, and narrow seats will become as important as it being lightweight! 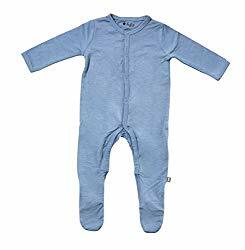 It comes in several models and colors so if you're in a cold weather state, you can get the zip on blanket to keep baby warm and dry (no babies in coats - makes the car seat ineffective). The Chicco brand is also synonymous with safety, quality and durability PLUS it's adaptable to just about any stroller you've got your eye on (the same can't be said of UppaBaby and some of the other brands previously mentioned). Hands down, this car seat beats out all the other brands for what twin parents need: affordability, lightweight, safety, adaptable to multiple stroller brands, and width for multiple children in car seats. Speaking of strollers, you're going to need something to hold those car seats until the babies are big enough to hold their heads up and sit up on their own in a regular stroller. I'm talking something lightweight that fits in your trunk and that you can snap open easily so that you can run errands - quick trips to the grocery or Target or Walmart for diapers - that kind of thing. When my husband is with us, we'll likely each grab a kid and baby wear (more on that later) but when I'm solo, I need something EASY and FAST to get my whole crew moving. 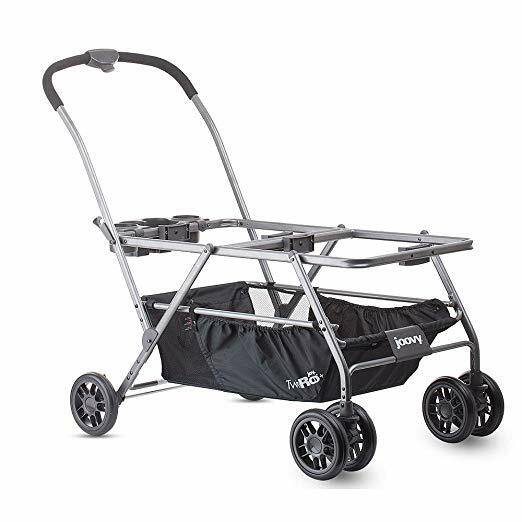 The Joovy is a stroller frame that you click your car seats into. It's lightweight and folds compact to fit in your trunk. Best yet, it has a massive storage basket under it, so you can fit shopping items in it or pack it up with baby necessities for multiples for an outing at the zoo or aquarium. 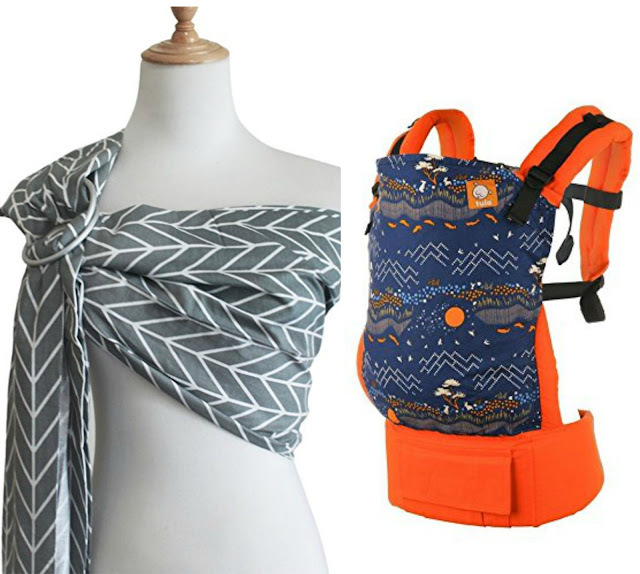 I'm a fan of the ring sling type carriers for infants, and my husband likes something more structured like the Tula (they come in so many cool designs and colors!) There's benefits to both types of carriers. The ring sling is great for infants to keep them close to you and double as a nursing cover. They're super easy to put on and grow with the baby - you adjust it every time you wear it and can do it by yourself. The Tula is great because it offers support around your waist and via your shoulders, so the weight of the baby is distributed. After you get it adjusted to fit you and your babe, it's really easy to put on and load up with the baby. One thing is for sure, if you have other kids besides your twins, you WILL be baby wearing so that you have free hands for your older children! 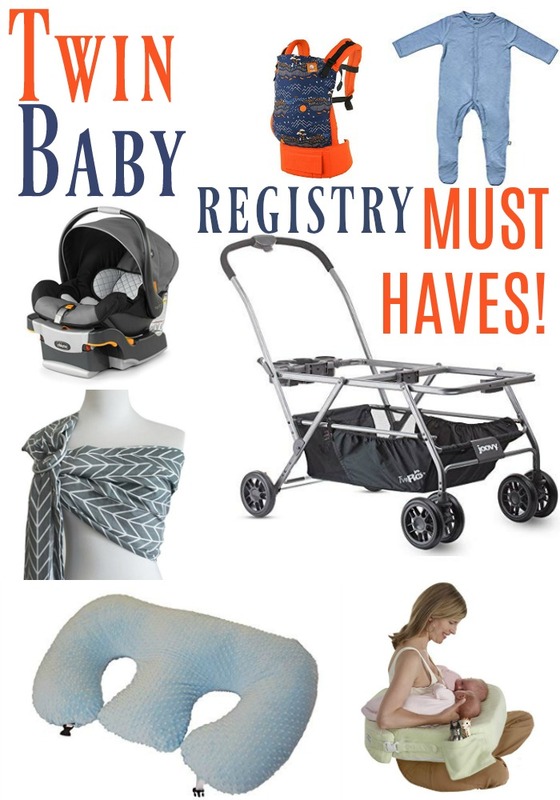 Obviously, diapers and bottles are a must have and they're listed on my first registry with a little strategy from an experienced mom: Don't buy too much of one kind until you know what baby will take (in terms of bottle) and what fits and works best with your baby's build (in terms of diaper). That's still generally true for twins, however, I wouldn't register for nor offer too many bottle options to your twins. You'll want them to take the same bottle, or you'll be deep in bottle hell of trying to remember who takes what, what pieces go with which, which pieces were sterilized last, and on and on. No thank you! I'm only offering one type of bottle to my twins. They'll get offered that or milk straight from the mama tap and that's it. Twin moms aint got no time to play around with what their babies prefer - the babies will get what they get! Diapers are the same in theory... Until/unless your twins are in two different sizes or one develops an allergic reaction to the chemicals in traditional diapers or one brand is great for one twin and leaks like crazy on your other twin! I had my Irish Twins in two different brands of diapers, and it was easy enough to keep them separate in bins monogrammed with their names on it. Henry used Babyganics and Otto was allergic to everything but Honest Co, and since all you do with diapers is put them on and throw them away (no parts! no sterilizing! no milk ounzes to remember!) it was a pretty easy process to have them in different brands. So, I'd register for the small packs of several different kinds to see what works best overall, or what works best for each baby and rest assured from this experienced mom: Having two in two different kinds of diapers isn't too much to handle, and is pretty easy to keep straight. Definitely easier than endless laundry from forcing your babies to wear diapers that don't fit them properly and cause leaks! One of the most fun - and potentially overwhelming! - things about having a baby is creating your registry. There's so many options, so many brands, so many colors of products and gear to chose from. Make your life easier by creating one universal baby registry that supports items from every store by heading over to Babylist.com! They even have consultants to help you and to answer your questions. I am excited to see all your baby twin things!! Will clothes from the boys work for the twins do you think? Can’t wait for you to have ALL THE BOYS. omg this is so good to know! THanks for sharing. I never knew anybody with twins. Babylist is seriously the coolest thing! I wish I'd known about it with E. And that stroller is seriously so key for twin mamas! Babylist sounds like a great tool for expecting parents. It makes it so much easier to create your perfect registry and I love the idea of getting free samples.